Correction: In the original positing of this article, we left out Barry Bonds’ 2002 season. This feat has been accomplished 16 times by 7 different players. Two have do so in the last 50 years. New English D apologizes for the error. 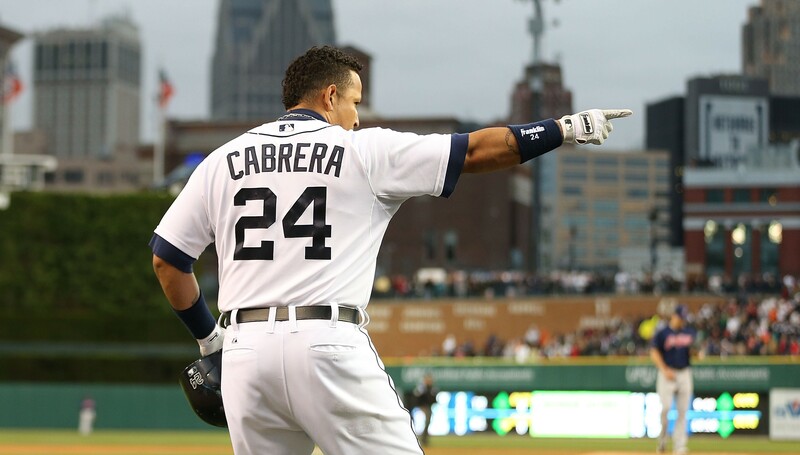 I think we’re past the point where I need to tell you that Miguel Cabrera is an exceptionally gifted hitter. It’s pretty clear. Obvious, even. Maybe we could argue over whether or not he’s the best hitter in the game or the best player or whatnot, but we’re all in agreement that he’s great and we’re all comfortable saying he’s having one of, if not, the best seasons right now. He’s a great player who is playing very well. He won the Triple Crown last year to a lot of fanfare, and while I don’t ascribe much importance to RBI, it’s still very interesting and very cool that he led the league in all three of those categories when no one had done it in decades. But he’s having a better season in 2013 than he did last year despite the fact that Chris Davis is out homering him. In fact, Cabrera is having quite the impressive season by any standard. By his triple slash line, (meaning his batting average, on base percentage, and slugging percentage), he is having a season that has only happened 15 times in the modern era (since 1901). Miguel Cabrera is currently hitting .370/.462/.646. which is tied with Davis for the best wRC+ in baseball at 199. Now that isn’t the best offensive season ever, but it’s very good. And it’s extremely rare. Since 1901, a .370/.460/.640 or better season has only happened 15 times it’s only been done by 6 separate players. Now I don’t mean to say that Cabrera’s first 74 games will perfectly predict his final stat line or that we can hope to extrapolate someone’s performance to predict the future, but these are rate stats and there is no real reason to think Cabrera is playing dramatically over his head. So it’s not totally unreasonable to consider these numbers as potential full season targets. And I also don’t mean to consider these statistics out of context. wRC+ and WAR are designed to compare players across eras, and I’m fully aware that Miguel Cabrera’s .370 average is not the same as a .370 in 1950. I’m not saying Cabrera is having one of the 20 best offensive seasons ever, I’m saying he’s having one of the rarest combinations of a high average, good patience, and power ever. What is also so remarkable about this is that only one of the 15 seasons on this list has come in the last 56 years (Here’s the full list). Only Todd Helton’s 2000 season (at Coors during the Steroid Era). Since Ted Williams did it in 1957, only one person has mixed a high average and power the way Cabrera is doing this year. I know the run scoring environment changes over time, but Cabrera is playing in a low average, low OBP, high power era relative to the others on this list, so it’s not like he’s unfairly lifted by context. Bonds never did it. Griffey never did it. Manny never did it. It’s pretty cool. Cabrera is essentially the best “pure hitter” and the best “power hitter” in baseball right now and he is having his best offensive season. Just look at the names on that list. Those are baseball’s all-time greats (and Todd Helton). Cabrera looks poised to win his 3rd consecutive batting title (he also finished 2nd in 2010) and is also hitting for excellent power. He’s doing something that has been done just once in the last half century and has only been done by some of the game’s best players. This isn’t meant to be a post about exactly where Cabrera’s season ranks or what it means to hit .370, it’s really just about pointing out how ridiculous it is to both hit .370 and slug .640. It’s not exactly a typical stat line. Miguel Cabrera isn’t exactly a typical hitter, though. 1.) NIGHT BASEBALL. 21st century technology or not, visibility is still better in the day time. One of the most interesting stats I’ve ever seen, was the breakdown for Rod Carew’s .388 season in 1978. Only about 1/3 of his games were played in daylight that year. As I recall correctly he hit something like .430 in those day games. 2.) LARGE GLOVES (and fielding in general). Nobody ever talks about fielding when comparing averages in the post war era to those of pre-war era. Look at the gloves that fielders wore in era of .370-400+ hitters and that alone should tell you something. Look at fielding averages as well. Today’s athletes are faster and more athletic and most likely have far more range than those of yesteryear, and they have the big gloves of the modern era as well. In virtually every game today you will see multiple diving, sliding or running catches that most certainly would have been base hits in 1930. Many of these plays would have been nigh on impossible with the gloves used in those days.